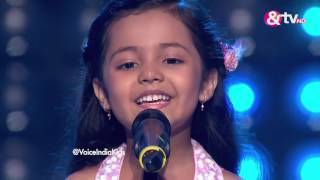 Ayat Shaikh creates magic through her voice and the judges are left mesmerised. Watch her entire performance here. Watch full episodes of The Voice India Kids on TV presents the biggest platform for kids to showcase their vocal talent to the nation The channel is all set to redefine weekends with the most dynamic singing reality show Patanjali Herbal Powervita presents The Voice India Kids powered by Surf Excel, starting July 23, every Saturday and Sunday at 9.00 pm. Taking on the mantle of mentoring this battalion of aspiring young singers are ace music composer-singer Shekhar Ravjiani the most charming and effervescent singer Shaan and the versatile singer and performer Neeti Mohan. It will be interesting to watch these little wonders, however little in size, make heads turn with the power of their Voice Popular actor Jay Bhanushali and singer-comedian Sugandha Mishra will be seen as hosts of the show. From the house of Talpa Media and produced by Endemol Shine India, the kids format will see participants from across the country in the age group of 6 - 14 years serenade one and all throughout Blinds, Battles and LIVE. The Voice is the purest form of singing reality show where the contestants are chosen solely on the basis of their voice and not appearance.